Property Size 2,870 sq. ft.
Nestled in the woods of Harbor Country just a five minute drive from Warren Dunes State Park, this home takes full advantage of the privacy and seclusion that the forests on the shores of Lake Michigan have to offer. From the small herds of deer that stroll casually down the middle of the street to the 400 ft of private beach only a 700 ft walk away, this home is truly a Michigan getaway. This home was built with vacation in mind. The spacious common areas have taken full advantage of the size of the home with a multitude of windows offering gorgeous views of the surrounding forest. Volume wood Shiplap ceilings and farmhouse lighting add to the character and charm of this delightful home. On the main floor, the large family room offers seating for everyone to gather around the mounted flat screen tv or the wood burning fireplace. The living area off of the great room is surrounded by windows on three sides and a beautiful space for enjoying conversation with friends or taking in some early morning views. The open kitchen and dining room make entertaining and meal time a breeze. The master bedroom on the main floor hosts a large en suite full bathroom with a shower and large jetted tub. An outdoor shower and a shower directly adjacent to the back entrance makes cleaning up after the beach easy and convenient. Upstairs and overlooking the great room are two more bedrooms and a single full bathroom. A corner queen bedroom soaks up the forest views while the other bedroom has two twin beds and a bunk to give arrangements for the whole family. Additionally, a full daybed tucked into the upstairs loft makes use of an adorable little window nook. 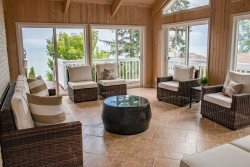 Whether you’re looking to catch up on your reading to the sounds of the breeze rustling through the trees or a comfortable place to unwind after a long day in the waves, this home is perfect for the full Michigan experience.